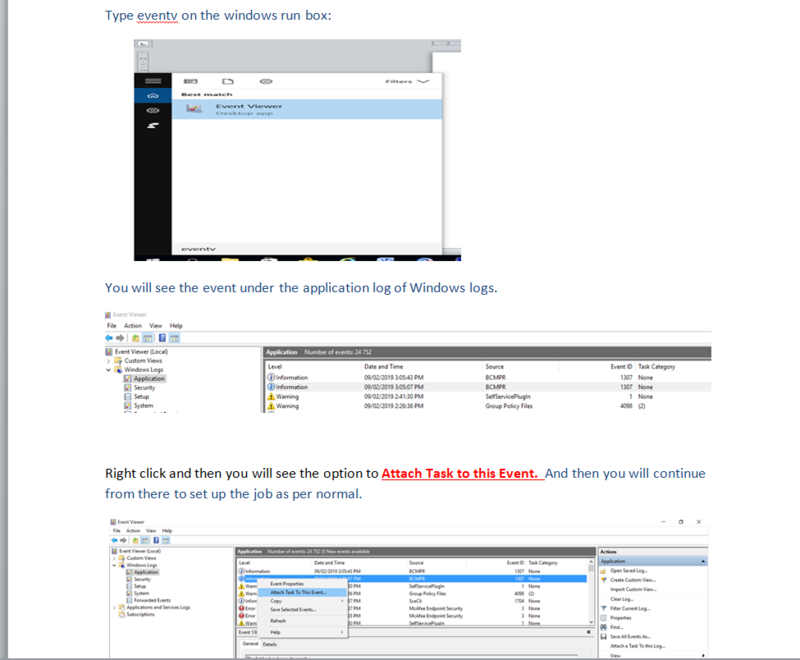 I have been trying to get a way of running a windows task based on event. The event is a file being changed on a folder. This file is being changed by another process that I do not have control over. However when that file changes, I need a certain windows task to be triggered. Preferably the solution must be in C# because the policy in our company does not allow the running of PowerShell scripts. //Notes: The target folder is given in the parameter file. The first time the application runs must be run as an administrator. Please note that the Folder(C:\Data\TEST) and file extension(*.txt) can be changed to user requirements. Not the answer you're looking for? Browse other questions tagged windows c# tasks or ask your own question. Can an unprivileged user be given read-only rights to a SYSTEM task? Why is Task Scheduler triggered by logging of one event but not the other?